It’s perfect weather for ice cream here in Dallas. So I am busy making new flavors like this Chocolate Almond Butter Ice Cream. Or rather, “nice cream.” I call it nice cream because it’s made with frozen bananas. That makes it very healthy too! Now, don’t get scared off by the phrase, healthy ice cream. I promise it’s really delicious! My 6 year old actually begs for this almost every afternoon in the summer. The best part about this? You don’t even need an ice cream maker to make this! Yay! I didn’t blend mine super well because I liked the bananas kind of chunky, but you are more than welcome to blend until smooth. You can also make this with sunflower butter instead of almond butter for a nut free option. When I go to the store, I always buy two bunches of bananas so I can put one bunch in the freezer. That way I always have bananas on hand to make this. If you don’t want to make ice cream, you can also make this into popsicles. Just mix together and pour into popsicle molds. Then freeze. Super easy too. A healthy ice cream you can feel good about eating! Zero added sugar and perfect for summer! In a food processor , add the bananas an start to blend. Once they look a little broken down, add the remaining ingredients and blend until smooth. You may need to add a little dairy free milk to get the mixture smooth. The ice cream will be a soft serve consistency. If you like a harder ice cream, just transfer to an ice cream tub and place in the freezer for one hour. This should last a few weeks in the freezer. Enjoy! Yum! This ice cream looks great! Love that it is made with such simple and healthy ingredients, too. The video shows more than a 1/2 T almond milk. Is that right? What ice cream tubs would you recommend? This ice cream looks REALLY good, and I'd like to try it out. 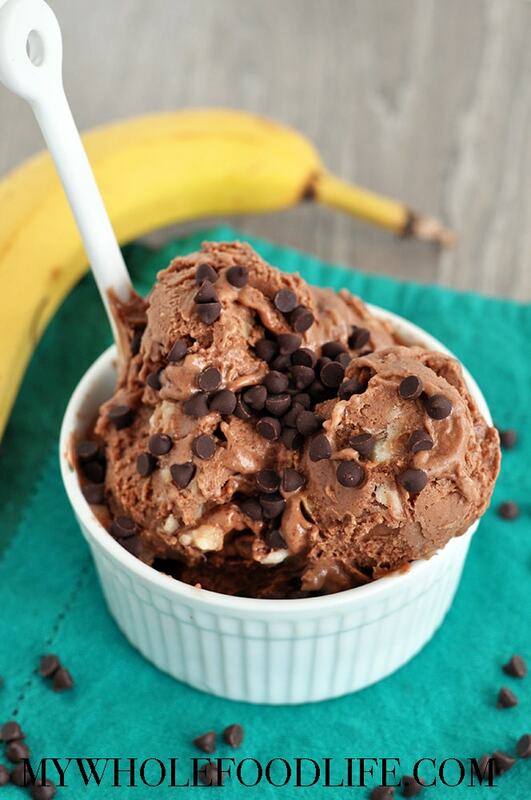 What level of ripeness would you say is best for making banana "ice cream"? thanks! Thank you!! They definitely need to be rip with a little brown spotting. That will make them sweeter.